camera crushing vegetables belonging to vendors. CHIKOMBA - Vendors are up in arms against their District Administrator (DA) Michael Mariga who allegedly joined a Police campaign to drive vendors out of the streets of Chivhu and allegedly used his vehicle to drive over wares and fruits including tomatoes that were being sold. Vendors who spoke to The Mirror specifically alleged that Mariga used his Government vehicle to run over tomatoes. Mariga is said to have told vendors that he was running over the tomatoes in order to punish them for resisting Police efforts to remove them from the streets. When contacted for a comment Maria’s mobile was answered by a Mr Hlathwayo who said the Da was in a meeting in Harare. Mashonaland East provincial administrator Tavabarira Kutamahufa said he had not yet received report on the matter. “I will investigate on the matter,” he said. Chikomba Residents and Rate Payers Association (CHRRA) chairperson Collen Zvarevashe said that his organisation told Mariga to compensate three vendors for their tomatoes. He said the value of the destroyed vegetables was $45. 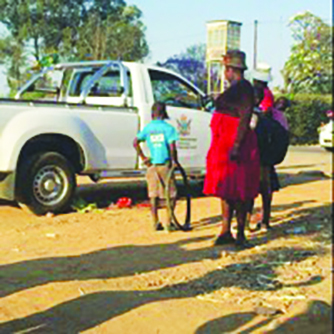 A 62-year-old vendor, Magi Mapfumo alleged that she was selling her wares at the entrance to Pick n Pay Supermarket when Mariga drove over the tomatoes that she was selling. I had to jump away in order to avoid being run over. I have been a vendor for more than 10 years and have never seen such callous behaviour,” said Mapfumo. Christina Muzenda (29) who was selling vegetables at a pavement in York Street alleged that the DA purported to be a customer and took some tomatoes and okra worth $10 and drove away without paying for them. She alleged that Mariga said it was the price for refusing to go to the designated vending site. National Vendors Union of Zimbabwe (NAVUZ) chairperson Steen Zvorwadza described Mariga's behaviour as “despicable”. “The DA must be prosecuted for his conduct. As vendors, we support Government policy to restore sanity in cities but not in this fashion,” said Zvorwadza. Southern Africa director of Human Rights Watch Dewa Mavhinga said Mariga must be investigated. Chikomba Rural District Council acting chief executive officer Bullen Chiwara declined to comment on the matter saying it would create divisions between him and the DA. “You should have written other good things that the DA has done. Otherwise there is nothing to write about on this issue of vendors,” said Chiwara.